Interesting alternative to spend some time swimming in Barcelona. Is it not your first time here? Tell us how it went utilizing the Facebook comments below or contacting us directly! 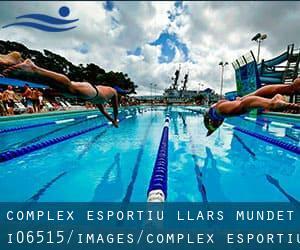 Complex Esportiu Llars Mundet is only one of all of the swimming pools Swimia is providing you, and its facts has been shared with us by a swimmer like you.Remember you'll be able to now promote Complex Esportiu Llars Mundet by sharing this page with your friends, adding comments and linking to us. This sports center offers 25 meters x 12.5 meters, 6 lanes, 1.8 meters - 2.2 meters depth, 1.8 meters - 2.2 meters depth, Indoors. For this Swimming Pool, only phone number is number here. Updated on 2019 Carrer De Galileu 186 , Les Corts , Barcelona , Spain (Postal Code: 08028). Swimmers like you reported 25 meters, 5 lanes, Indoors. Unfortunately we do not have the e-mail address of this Swimming Pool, but we can provide you with the phone number. Updated on 2019 Rambla Guipúscoa, 25 , Barcelona , Spain (Postal Code: 08018). Among all of the activities offered by the center, if you are thinking about swimming you'll enjoy 25 meters x 12.5 meters, 6 lanes, Indoors. If you'll want to get in touch with this Pool, e-mail address and phone number are both number. Updated on 2019 Carrer Comte Borrell, 21-33 , Barcelona , Spain (Postal Code: 08015). Among all the activities provided by the center, if you are keen on swimming you can appreciate 20 meters x 17 meters, 1.2 meters depth, 1.2 meters depth, Indoors. Just in case you would like to contact this Swimming Pool just before dropping by, we only know the phone number. Updated on 2019 Carrer de Vista Bella, 11 , Sarrià-St Gervasi , Barcelona , Spain (Postal Code: 08022). This sports center gives 20 meters x 10.5 meters, Indoors. Contact information and facts for this Swimming Pool like phone number and email address are number. Updated on 2019 Carrer de Provença, 408 , Barcelona , Spain (Postal Code: 08025). Among all the activities offered by the center, if you're thinking about swimming you might enjoy 25 meters x 15 meters, Indoors. Just in case you need to contact this Pool prior to dropping by, we only know the phone number. Updated on 2019 Calle Artesania, 63 , Nou Barris , Barcelona , Spain (Postal Code: 08042). Swimmers like you reported 25 meters x 12.5 meters, 6 lanes, 1.8 meters depth, 1.8 meters depth, Indoors. Unfortunately we do not have the e-mail address of this Pool, but we can give you the phone number. Updated on 2019 Carrer dels Esports 2-8 , Barcelona , Spain (Postal Code: 08017). This great and large sports center lets professional swimmers like you enjoy 25 meters x 12.5 meters, 7 lanes, Indoors. Additionally, within these facilities you can try 25 meters x 12 meters, 5 lanes, Indoor/Outdoor. Phone number and email address are number for this Pool. Updated on 2019 Paseo Joan de Borbo, 93 , Barceloneta , Ciutat Vella , Barcelona , Spain (Postal Code: 08003). Swimmers like you have reported 25 meters, 25 lanes, 2m depth, Indoors, Outdoors, Salt Water. Also, you will find 5 meters, 1 lanes, 1.20m depth. If you'll want to make contact with this Swimming Pool, email address and phone number are both number. Updated on 2019 Carrer Del Segura 36 , Sants-Montjuic , Barcelona , Spain (Postal Code: 08038). Among all of the activities offered by the center, if you are thinking about swimming you'll enjoy Olympic size x 21 meters, 8 lanes, 2.1 meters depth, 2.1 meters depth, Indoor/Outdoor. If you'll want to get in touch with this Pool, e-mail address and phone number are both number. Updated on 2019 Nàpolis, 42 , Eixample , Barcelona , Spain (Postal Code: 08018). This sports center offers 25 meters x 12.5 meters, 6 lanes, Indoors. Contact data for this Swimming Pool such as phone number and e-mail address are number. Updated on 2019 C Pomaret, 49-53 , Sarria , Barcelona , Spain (Postal Code: 08017). Swimmers like you reported 20 meters x 8 meters, Indoors. Unfortunately we do not have the e-mail address of this Pool, but we can give you the phone number. Updated on 2019 Ganduxer, 25-27 , Barcelona , Spain (Postal Code: 08021). Among all of the activities offered by the center, if you are thinking about swimming you will appreciate Olympic size, 2 lanes + 25 meters, 2 lanes + 25 meters, 12 lanes, Indoor/Outdoor. Just in case you want to contact this Swimming Pool before dropping by, we only know the phone number. Updated on 2019 Carrer del Regent Mendieta, 14-20 , Barcelona , Spain (Postal Code: 08028). Swimmers like you reported 25 meters x 16-2/3 meters, Indoors. Unfortunately we do not have the e-mail address of this Swimming Pool, but we can provide you with the phone number.